Sharon Stone is the woman with no name in Sam Raimi’s under-rated western that includes some great performances by some now familiar but then mostly unknown faces. Plot: A female gunfighter returns to a frontier town where a dueling tournament is being held, which she enters in an effort to avenge her father's death. In the lawless town of Redemption, the town’s mayor, Herod (Gene Hackman), holds an annual Quick Draw competition, where each man in the contest must face another contestant each day, the winner decided by whoever is left standing (or alive). A woman with no name, referred to only as The Lady (Sharon Stone), rides into town as the contest is about to begin, seeking revenge against the mayor for reasons that are slowly revealed as the movie nears its conclusion. 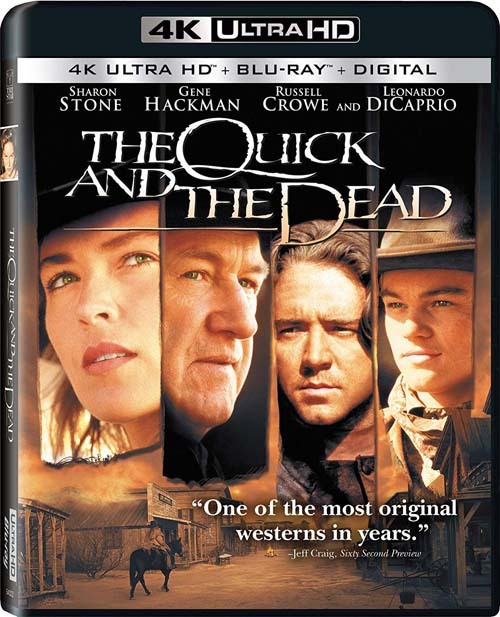 It’s a bit of a shame that The Quick and the Dead was largely ignored by both critics (only 56% on Rotten Tomatoes) and American audiences (only $18.6 million on a $35 million budget at the box office), as this is possibly the best of his movies during his post Evil Dead and pre Spider-Man period. The film unmistakably has his visual trademark with odd and often peculiar camera angles and edits, as well as some occasional cartoon-inspired violence (such as bullet holes that go through the body, leaving a gaping hole with no sign of blood). Sharon Stone holds her own against what today would be considered an all-star cast, flinging some great one-liners to her rivals. Hackman plays a slightly more comical version of his role as Little Bill Daggett in Clint Eastwood’s Unforgiven. Leonardo DiCaprio shows a lot of enthusiasm as The Kid, a character possibly too impressed with himself while desperately trying to impress someone in particular. A very young Russell Crowe plays a former member of Herod’s gang of outlaws now turned preacher, wrestling with his thirst for violence and revenge. Lance Henricksen, Keith David, Pat Hingle, Gary Sinise, Roberts Blossom, and Tobin Bell round out the cast. The Quick and the Dead was not only shot on 35mm film, it was completed in the analog world of film as well. What that means is that Sony’s 2160p transfer, with HDR10 high dynamic range grading, is true 4K from beginning to end, beautifully capturing Dante Spinotti’s cinematography. Film grain has been faithfully retained, appearing natural and organic. Detail is extremely strong, from the weathered wood of the town’s buildings to the textures of the fabrics used in the costumes to the beard stubble on many of the actors’ faces. Colors are often bold and vivid, appearing natural without blooming. Contrast is spot-on as well, providing deep blacks without crushing and bright crisp whites that never clip. This is 4K at its finest! Sony has fitted this 4K release with a new Dolby Atmos mix that bests the already pretty solid DTS-HD MA 5.1 track included here that also appears on the included Blu-ray edition. Objects are more accurately placed, LFE is much tighter and bolder, Alan Silvestri’s score is much more immersive as are atmospheric sounds like wind and crickets. Most importantly, dialogue is always clear and understandable. Here’s a switch – the UHD disc has a few new extras, while the Blu-ray edition is the original barebones movie-only release. Deleted Scenes (1080p; 5:15): Seven very brief scenes have been included – Dog Kelly Extended, The Wedding, Glass of Water, You Shouldn’t Drink, Get Out Here, Where’s Cort, and We’re Different. Theatrical Trailer (1080p, 2:18): The trailer is presented in a pillarboxed 4:3 aspect ratio. Digital Copy: An insert contains a code to redeem a digital copy on Movies Anywhere, which provided me access to the movie in UHD on FandangoNow and Google Play Movies, while only HD (at the time of this review) on Vudu and Amazon Prime Video. The code also provides access to the movie on iTunes, but I do not own any Apple devices to verify the provide resolution on that service. If you don’t already own Sam Raimi’s The Quick and the Dead, or you are considering upgrading your DVD or Blu-ray copy of this film, this new 4K UHD Blu-ray release is the way to go, with outstanding video and audio, and a few extras thrown in for good measure. Thanks for the review Todd! My wife and I will be watching this tonight, for the first time. How I've managed to avoid it all these years is beyond me. I take issue with that statement, as “A Simple Plan” is, I believe, easily the best of his movies during that period (or, probably, any period) of Raimi’s career. One of my guilty pleasures that I watched this afternoon. I still like that Raimi infused spirit of filming. Enjoyable time with a good presentation of this film. I watched this with my wife on Friday, a first-time viewing for us both. LOVED it! I also like Raimi's style, and this movie has it in spades. A keeper for sure!